Hi! I’m Jemma Baylis, an Advertising and Marketing Communications Undergraduate at the University of Greenwich. 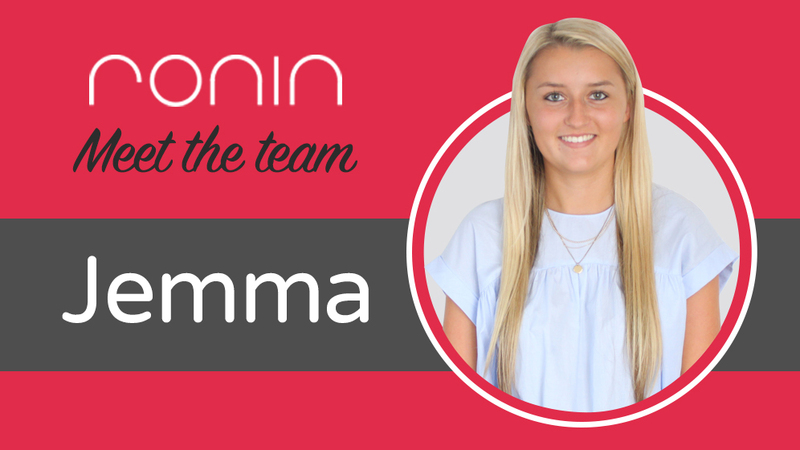 Marketing has always been the route I wanted to take, and upon leaving school I became a Digital Marketing Apprentice at a global media agency in Central London. I had a role as a media buyer on the TV and Radio team, planning and booking airtime for our clients. The apprenticeship lasted for 13 months, and even though I had a fantastic year making strong relationships with a number of respected individuals in the industry and attending high-profile events, I decided that I wanted to continue in education, and left my job to begin my degree. It’s now been a year since I left full-time work, and I can gladly say that working at RONIN has been a relief! The vibes in the office are so positive, and there’s never a moment when the team aren’t smiling. I’ve been working across a number of different clients and have enjoyed experiencing the intimacy of a smaller business, as well as spending a lot of time upstairs observing and listening to Nat and Dan whilst they create some amazing designs! As part of my placement, I’ve had the chance to work on: SEO, analytics, keyword planning, blog writing, press releases, news letters and market research, as well as writing and scheduling content for Twitter, Facebook, LinkedIn and Google+. I never expected to be given so much responsibility as an Intern, and I’ve even been able to create my own project for RONIN, which I’ve been working on alongside my dedicated tasks. My project aims to enhance RONIN’s Instagram presence by the end of 2017. I have created an easy-to-read model, which can be replicated year on year – a different RONINer has been nominated each week to oversee the company Instagram account and hold responsibility for posting any industry-relevant news, as well as personal posts like birthdays! I am incredibly grateful that the RONIN team has trusted my ideas and allowed me to experiment with this project. It has genuinely been a huge confidence boost to demonstrate my previous skills and experience a new environment. I’d like to say a special thank you to Judith and Steve for offering me the placement and for dedicating some challenging project work to me, as it really made me feel like an appreciated member of the team, rather than ‘just’ an intern. I’d also like to thank Andrea, Ellie, Caroline, Balbina and Demi for offering to help me on all of my tasks, as well as making sure I was added to the Spotify Playlist ‘RONIN Angels’, which is amazing by the way! And also a big thank you goes to Dan and Nat for adopting me up in the Design Studio – who knew you could enjoy Capital Radio so much?! RONIN are a fantastic company to work for, and I’d come back within a heartbeat. Every member of the team brings a different skill and personality to the office – plus I don’t think I’ve ever been so hydrated in my life! I will miss the “Would anybody like a drink?” announcement every ten minutes, and I will especially miss the ‘Friday’ song. You’ll have to come and join the team to find out what it is!